The new Pentax Optio RS1500 comes with 10 'skins' to let users change its appearance. Pentax has unveiled a new addition to its Chameleon camera range: the 14MP Optio RS1500. The compact camera lets users change the camera's appearance with a set of 10 ready-make 'skins', which fit the frame of the Optio RS1500 underneath a removable protective layer. 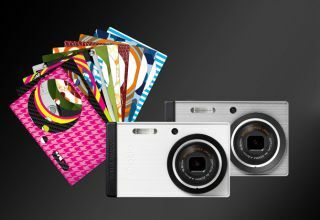 The 10 skins are included with new Pentax compact camera, which also comes with five blank pre-cut paper foils for users to create their own designs. In addition, the Optio RS1500 includes two lens rings - black and orange. This latest Pentax Optio camera boasts a 4x wideangle zoom (28-112 equivalent), along with 720p HD video recording and a 3-inch LCD screen. Other key features include a Face Priority mode, Smile Detection and Natural Skin Modes. The Pentax Optio RS1500 UK release date is April 2011 with a price set for £89.99.